The Finest Cookie Ever Made | machinehead! 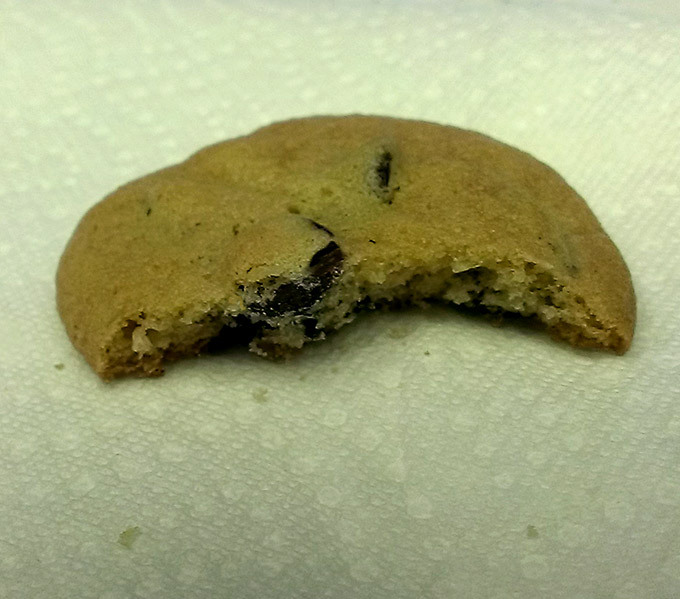 As chocolate chips cookies go, it wasn’t the biggest, nor was it crammed full of rich chunks of boutique chocolate. It was, in fact, quite small, with a modest amount of fairly typical, off the shelf, Nestle Toll House chips. Made not with some fine farine à pâtisserie but most likely a supermarket gold medal flour or its CostCo equivalent. What was so special about this cookie went far beyond its appearance and ingredients. At the first bite, I was instantly transported to my childhood or, more accurately, to my entire childhood simultaneously. I was hit by a rush of memories and a flood of emotions. Then, after finishing the first bite, I was instantly catapulted to a brief glimpse of the future before being jerked roughly back to the present. Oh yes, and it tasted fantastic. The whole experience would be best described as intensely bittersweet. You see, this cookie was much more than just a cookie. I found it along with 3 other cookies in a freezer bag in my mother’s freezer. They were the last cookies that she would ever make. The very last of which I will ever eat again. I felt that it was the perfect parting gift from the remarkable and beautiful woman who gave me my life and so much more. A very special cookie indeed! *Note: I really couldn’t get down to writing anything more here until I wrote something about my mother’s passing. I know that the main focus here is guitar related however also meant for this blog to reflect me personally. So here then is my excuse. I shall hereafter be writing more often and soon. Thanks for your understanding! sorry for your lose…. it is a terrible thing…. um… I hate to ask…. but… did you save me a cookie???? My most sincere condolences, Michael. No matter the relationship, losing a Mom is like nothing else. Keep her alive in your heart and she’ll never be far away. I lost mine to cancer 19 years ago, November 1st, and it can still get to me. I was the last to see her at the hospice that morning and told her it was OK to go if she wanted to. Hello brother Tig. Very good to hear from you! Thanks very much for the kind words. I’m sorry to hear about your mother but I appreciate you sharing your experience. Yes, right now I’m still in the, “I think I’ll give Mom a call”, “I’m going to send her this picture”, phase. Many split-second thoughts throughout the day which only serve to remind that she is no longer here. I come from a fairly big, supportive family so we’re all looking after one another and remembering our mother/grandmother with much deserved love and respect. I suppose this is the way of life. Death is the natural and necessary conclusion as is the personal and sometimes emotional reaction to it. What makes it easier to deal with is the support of friends and family. Again, thanks, my friend. BTW, I hope all is well with you. It has been awhile, hasn’t it?